Compact, lightweight, and battery-powered, the AQ7250 offers a range of functions and capabilities ideal for field use. Its exceptional wide, dynamic range is particularly effective for measuring lines over long distances, as well as lines with heavy loss. A wide range of optional equipment enables a single unit to be used for measurements on a variety of optical fiber lines. 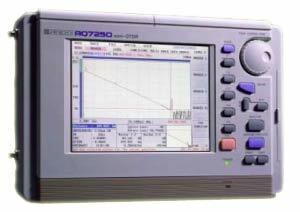 The AQ7255 single-mode fiber optical unit (wavelength: 1.31/15.5 µm) provides a dynamic range of 41.5/39.5 dB. In addition, the instrument''''s short dead zone detects reflections occurring as close as three meters. Improvements in measuring speed enable the AQ7250 to measure a splice loss of 0.5 dB produced 70km away-- in 20 seconds.